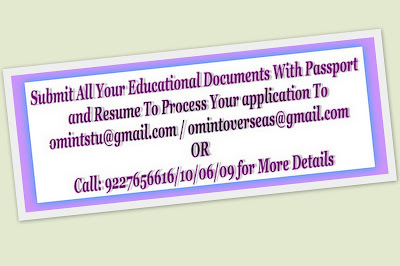 OM VISA Consultancy - Global Immigration, Students, Visitor, Business & Work VISA Consultants: HIGH SCHOOL EDUCATION IN AUSTRALIA... APRIL 2017 Session, PARENT CAN ACCOMPANY & WORK LEGALLY, Get Benefit , Enroll Now Through Gujarat's Top Leading Visa Consultancy "OM INTERNATIONAL"
HIGH SCHOOL EDUCATION IN AUSTRALIA... APRIL 2017 Session, PARENT CAN ACCOMPANY & WORK LEGALLY, Get Benefit , Enroll Now Through Gujarat's Top Leading Visa Consultancy "OM INTERNATIONAL"
Parent can travel and can work legally. For 1-6 grade : App. $6000 per semester. Initial payment fees plus the insurance. Students may be required to pay additional fees relating to specialist subjects and activities depending on the subjects selected. Copy of the educational documents. Copy of the previous 2 year class report. The student should be less than 18 years of age and under 12th standard.